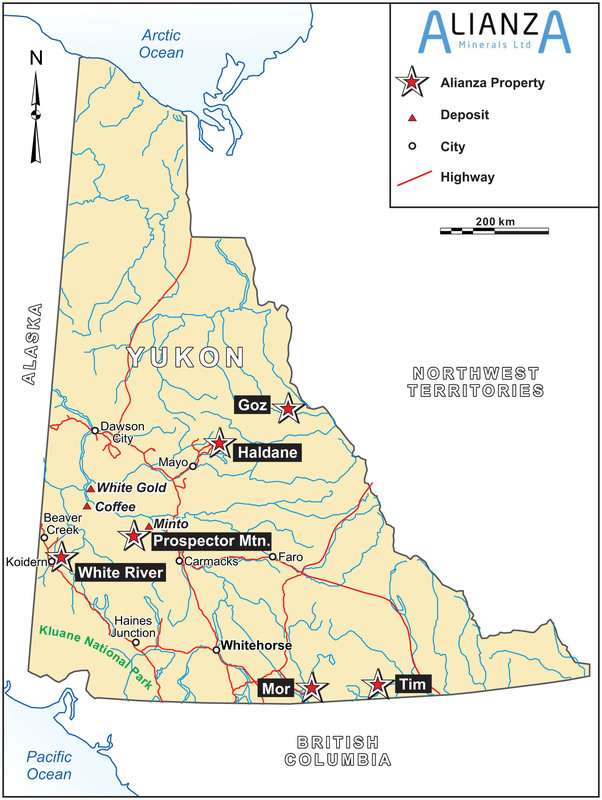 The MOR Property consists of 290 mineral claims (approx 6,000 hectares) located 35 km east of Teslin, Yukon, Canada. The property is just 1.5 km north of the paved, all weather Alaska Highway. A planned hydro-electric generating station is sited 3 km southwest of the property (source: Yukon Energy). The port of Skagway lies 295 km southwest of the property by road. Alianza believes the geology is conducive to VMS (volcanogenic massive sulphide) style deposits. The stratigraphy is believed to be part of the Yukon-Tanana-Terrane, having similarities to the Finlayson Lake District which hosts several significant VMS deposits including Wolverine and Kud Ze Kayah. During 2008, 8 diamond drill holes were completed for a total of 1,703 metres, with drilling primarily focused on the Discovery Zone and the newly located SD Zone. Six diamond drill holes were located to test the strike and down-dip extension of the massive sulphide lenses associated with the Discovery Horizon and a near surface Induced Polarization anomaly modelled from previous survey data. The highlight of the Discovery Zone drilling was a 1.15 metre intersection grading 6.74% zinc, 0.58 g/t gold and 51 g/t silver from Hole MOR08-06. Three of six holes (MOR08-06 to -08) tested the extension of the Discovery Horizon at 100 m step outs to the east. Each of the holes encountered the target horizon but each contained decreasing sulphide and metal content in that direction. Two additional drill holes (MOR08-09 and -11) were located to test the down-dip extension of the thickest sulphide accumulations (15.5 m and 10.6 m, respectively) from previous drill campaigns however, neither of the holes encountered significant mineralization. One of the last drill holes in this target area (MOR08-10) was located to test a near surface IP conductor. It cut a narrow sulphide band near the top of the hole associated with the lower lens of the Discovery Horizon but did not encounter significant mineralization in the vicinity of the modeled conductor. Significant assays for intersections within the Discovery Zone are shown in Table I. The SD Zone is defined by three or more northwest trending, gently southwest dipping sulphide bearing mafic and felsic metavolcanic horizons in the southern portion of the claim block. Three horizons have been identified to date within a 250 m thick package of dominantly felsic to intermediate metavolcanic stratigraphy. The area is heavily vegetated with rare outcrop and subcrop exposure. Grid soil geochemical response in the vicinity of the mineralized horizons outlined weak intermittent point anomalies for copper, zinc and silver along a northwesterly trend, parallel to the projected trace of the mineralized strata. Diamond drilling in 2008 targeted a strong localized VTEM conductor and coincident magnetic anomaly. Narrow massive sulphide intervals were intersected in two holes spaced 150 m apart on two section lines. The sulphide intercepts consist dominantly of strongly folded and finely laminated pyrrhotite, pyrite and minor visible chalcopyrite plus wispy magnetite. Significant assays for these intervals are shown below in Table II. The two upper intervals in each of the holes correspond to the SD Horizon while the lower interval in MOR08-12 is believed to be the down-dip expression of a surface showing 300 m to the northeast referred to as the Mag Horizon. Prospecting 700 m southeast along the strike of the SD Horizon discovered a kill zone referred to as the Bean Showing containing in-situ semi-massive and heavily disseminated pyrite dominant chlorite-altered mafic metavolcanic strata exposed across approximately 1 m true thickness. Sawn channel samples collected across the exposure returned only weakly elevated copper response with values ranging from zero to 1135 ppm. After the completion of diamond drilling in 2008, 2.5 line kilometres of ground based gravity surveys were conducted across the Discovery and SD zones. At the Discovery Zone, two lines were run along existing geophysical cut lines and coincident drill section lines which encountered cumulative sulphide intersections up to 15.5 m and 10.6 m thick. Preliminary bouguer profiles indicate a 1 mgal anomaly roughly 100 m in length above the 10.6 m sulphide intersection. A 1 mgal anomaly is also indicated along the northern survey line located at the SD Zone. This anomaly however, appears to be associated with a target stratigraphically deeper than the SD Horizon and is largely overlain by swamp. Approximately 220 line kilometres of airborne VTEM surveys were conducted over new claims staked south of the SD Zone mineralization. This data is currently being assessed and modelled. The six hundred eighty five meter (685 meters) diamond drilling program tested the surface trace of the “Discovery Horizon” for approximately 300 meters along strike and 90 meters downdip. Mineralization appears to be increasing in both width and grade at depth. Holes MOR 07-01 and MOR 07-02 tested mineralization downdip of two holes drilled 100 meters apart in 2004 and returned multiple intervals including 3.35% zinc, 0.88% copper, 0.56% lead, 45.5 grams silver and 0.56 gram gold per tonne over 4.01 meters and 1.52% zinc, 1.18% copper, 0.27% lead, 52.2 grams silver and 1.256 gram gold per tonne over 7.8 meters, respectively. Hole MOR 07-03 was drilled 200 meters to the east and cut multiple intervals including 5.46 meters of 2.85% zinc, 1.20% copper, 55.8 grams silver and 1.356 grams gold per tonne, while hole MOR 07-04 tested the up dip projection of this mineralization yielding 0.76% zinc, 0.53% copper, 0.17% lead, 21.7 grams silver and 0.356 gram gold per tonne over 1.21 meters. Holes MOR 07-02 and MOR 07-03 contain significant gold and copper intervals, 2.54 meters grading 2.02% copper as well as 2.47 gram gold per tonne and 2.49 meters grading 2.53% copper as well as 2.53 grams gold per tonne, respectively. Zinc values of 4.25% over 2.59 meters and 4.19% over 2.25 meters were recorded in holes MOR 07-01 and MOR 07-03 respectively. Drilling indicates the presence of two to three gently dipping sulphide horizons hosted within an alternating succession of felsic to mafic volcaniclastic stratigraphy and tuffaceous metasedimentary rocks.